My husband had planned to attend a training program in London later in October this year, and he had applied for a Business Visit Visa from Riyadh, KSA. Me and my daughter applied along with him as General Visitors. My husband had attended a training program in London in 2014 as well at the same institute, and we had accompanied him on his visit. We stayed in London for 10 days. That was the first time, me and my daughter received UK visa, whereas my husband had traveled to UK before in 2008 as well, on Business Visit Visa, and had stayed there for about 3 months. That visa was granted from Islamabad, Pakistan. So we do have a history of past travel and compliance. 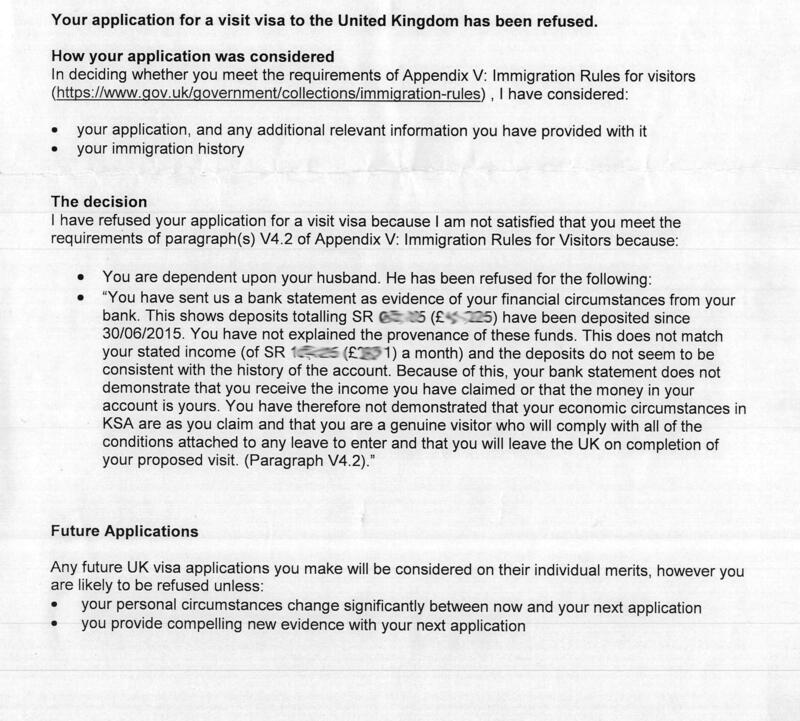 We were quite sure that our visa will be approved this time around as well, but it was refused. My envelope and my daughters' contained a letter of refusal. Her stated that since her parents had not been granted a visa, her application was being refused as well. Mine stated that since I was dependent on my husband, my visa could not be granted either. It also stated that his was refused because of a substantial amount transferred into his account before the application, which was other than his salary. That amount was transferred by his employer as a performance bonus. We were not aware of the 'PARKING' strategy, and did not attach any evidence of where that transfer came from. Therefore the visa officer was not sure of his financial status, and did not consider him to be a genuine visitor. My husband also has another bank account, in which he keeps his savings. He had not attached a bank statement related to that account thinking of it as unnecessary. He had not attached any evidence of his savings account in his previous application either which got approved. Also, his envelope did not contain anything other than his passport. There was no letter of refusal. And me and my daughter had a black box stamped on the last page of our passports, which said UK/Riyadh, and had a number hand written on top. His passport did not contain any such stamp. We got to know that his was refused from the letter that came with my passport. Now his employer wants him to register for the same course in December, and re-apply for the visa. He is going to obtain a letter from the company, endorsing all the extra transfers in his salary account, other than his monthly salaries. He is also planning to attach the bank statement of his savings account, along with that of his salary account. Will they want to know why he did not mention his other account in the previous application? My husband earns well, and we have been settled in Riyadh for about 6 years now. Is there anything else we need to attach with the application this time? We did enclose the invitation letter, letter from the company indicating his designation and salary, our marriage certificate and our daughters'birth certificate. We attached all those documents, that we did last time when our visa got approved. So I assume there was no short-coming in that regard. But now that we have been refused the visa once, I have heard our applications will be undergo stricter scrutiny. Will it take longer than usual now? The next session for the training starts on 7th December, so can we expect an outcome before that? Any suggestions in this regard will be really helpful. Based upon your refusal notice, they suspect you tried a parking strategy and were planning to abscond when you arrived in the UK (Paragraph V 4.2 of the rules). A definition and description of funds parking is given here , and your narrative explains that you are now aware of what they are looking for and know how to avoid this kind of refusal. There's additional information about the "provenance of funds" for you in this answer. Will they want to know why he did not mention his other account in the previous application? There is no hard requirement for this, but it would be prudent to offer something as they mentioned this explicitly in the refusal notice. Generally it's best practices to explain everything mentioned in a previous refusal. Is there anything else we need to attach with the application this time? If you are taking your daughter out of school, you should include something from the school, otherwise your list looks fine. Will it take longer than usual now? Yes, but not significantly. You will be able to meet a December travel date if you apply later this month. Any suggestions in this regard will be really helpful. The best suggestion is to have your application examined by a UK based solicitor before you submit it. This is not necessary but constitutes a best practices approach following a refusal. You will have to pay a fee, and I would ask your husband's employer to expense the fees for this because they are putting him in the course. You can find a list of practitioners at the Immigration Law Practitioners' Association. Their info sheet on the visitor rules is great research material. I suggest downloading and studying it. Not the answer you're looking for? Browse other questions tagged uk visa-refusals pakistani-citizens proof-provenance-of-funds saudi-arabia or ask your own question.